Esco Tool has introduced two alternative portable pipe milling tools for performing welding end preps on pipe and tube from 0.5” I.D. to 3” O.D. with different bore sizes and wall thicknesses. 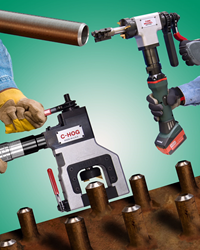 MILLHOG® Pipe Beveling Tools are for performing welding end preps on pipe and tube from 0.5” I.D. to 3” O.D. with different bores and wall thicknesses. Tube Weasel MILLHOG® and C-Hog MILLHOG® tools provide rigid mounting with internal and external clamping surfaces, respectively, and torque-free operation. Esco Tool has introduced two alternative portable pipe milling tools for performing welding end preps on pipe and tube from 0.5” I.D. to 3” O.D. with different bores and wall thicknesses. MILLHOG® Pipe Beveling Tools for pipe and tube from 0.5” I.D. to 3” O.D. work well on all hard alloys without cutting fluids and can bevel, face, and bore simultaneously. For applications from 0.75” I.D., the Tube Weasel right angle I.D. clamping tool is self-centering and fits a Dutchman 2.75” W and for applications with small bore heavy wall tube and pipe, the C-HOG rigidly clamps on the O.D. allowing the use of larger I.D. boring blades. Available with pneumatic, electric, or battery power, Tube Weasel MILLHOG® and C-Hog MILLHOG® tools provide rigid mounting with internal and external clamping surfaces, respectively, and torque-free operation. Both tools feature robust construction and utilize cutter blades with radical chip breakers that transfer heat away from the surface. Standard blades are TiN coated and a Hard Lube version is offered for superior heat resistance. The Tube Weasel MILLHOG® is priced from $4,495.00 and the C-Hog MILLHOG® is $3,995.00 and both tools are available for rent. ESCO Tool, A Unit of Esco Technologies, Inc.